Many trees shed their leaves each year and most animals produce droppings at least once a day. All plants and animals eventually die. Microorganisms play an important part in decomposing this material so that it can be used again by plants. The same material is recycled over and over again and can lead to stable communities. Living things remove materials from the environment for growth and other processes. These materials are returned to the environment either in waste materials or when living things die and decay. Materials decay because they are broken down (digested) by microorganisms (decomposers). Microorganisms digest materials faster in warm, moist conditions. Many microorganisms are also more active when there is plenty of oxygen – aerobic conditions. The decay process releases substances which plants need to grow. In a stable community, the processes which remove materials are balanced by processes which return materials. The materials are constantly cycled. 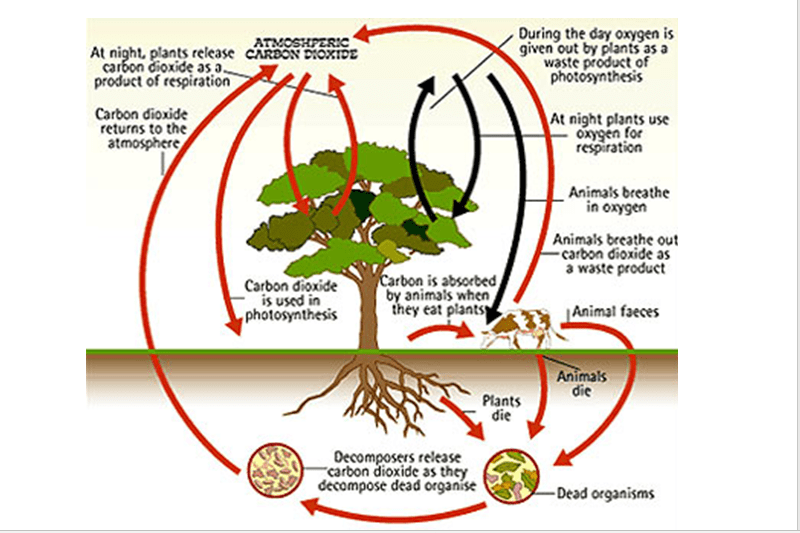 The constant cycling of carbon in ecosystems. Carbon dioxide is removed from the environment by green plants and algae for photosynthesis. The carbon from the carbon dioxide is used to make carbohydrates, fats and proteins which make up the body of plants and algae. Some of the carbon dioxide is returned to the atmosphere when green plants and algae respire. When green plants and algae are eaten by animals and these animals are eaten by other animals, some of the carbon becomes part of the fats and proteins which make up their bodies. When animals respire some of this carbon becomes carbon dioxide and is released into the atmosphere. When plants, algae and animals die, some animals (detritus feeders) and microorganisms (decomposers) feed on their bodies. Carbon is released into the atmosphere as carbon dioxide when these organisms respire. By the time the microorganisms and detritus feeders have broken down the waste products and dead bodies of organisms in ecosystems and cycled the materials as plant nutrients, all the energy originally captured by green plants has been transferred. Combustion of wood and fossil fuels releases carbon dioxide into the atmosphere.